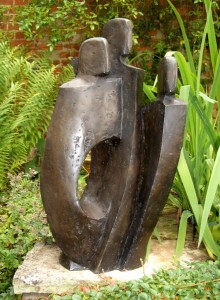 My garden sculptures are usually cast in either bronze, bronze or aluminium resin and are available in an edition of twelve only unless the prospective client wishes to have a unique piece, in which case I will create a garden sculpture only for them. This slideshow below shows how I create a garden sculpture from its starting point in a block of polystyrene to its finished state having been cast in aluminium resin. You will see the development of the process as the finished sculpture gradually emerges from the block. I cut the polystyrene block to an approximate size and use a hot wire tool to take away sections which approximate to the size and shape. I then use a smaller hot wire tool to refine the shape until I achieve the desired result. The finer details are then carved and smoothed. I usually then cover the entire sculpture with a very thin layer of plaster, sanding away the surface t with wet-and-dry sanding paper until I am satisfied. When the carving is finished it is then ready to go the the professional casters, where a mould is taken and the finished cast is patinated to my requirements. To scroll through the slides, click on the > symbol or use the slider on the right hand side of the slideshow window to move up and down between the images. 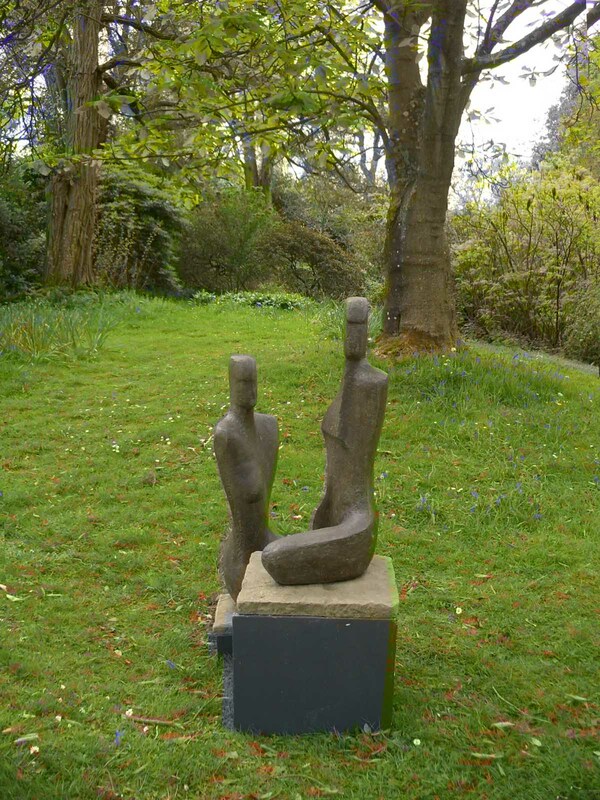 The Exhibition of garden sculptures at Borde Hill Gardens in West Sussex is sure to be a great success when it opens to be public on 1st May and continues until the end of September. Sculpture by 14 artists will be placed around the formal gardens and woodlands in this beautiful landscape. I set up three of my garden sculptures in the Garden of Allah, a tranquil glade in part of the woodland area. 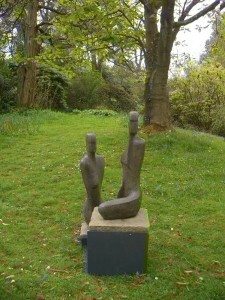 ‘Expectation ll’ is a two-part piece and is positioned so that the two figures look out into the landscape; these are complemented by ‘Seated Woman’ and ‘Stillness in the Midst’, a garden sculpture whose name was taken from a quotation by Saul Bellow – ‘Art has something to do with the achievement of stillness in the midst of chaos’. All my garden sculptures including the three exhibited this year at Borde Hill are in editions of 12, these three being in bronze resin in slightly different patinations, which look well against the surrounding majestic trees. These magnificent trees are part of the collection made by Col. Stephenson R Clarke who sponsored many of the plant hunters’ expeditions in the 19th and early 20th centuries to collect shrubs and trees from all over the world in order to create the beautiful landscape which we see today. Besides my garden sculptures there are pieces by Veda Hallows who creates works based on organic shapes and natural forms such as fruits and seeds, birds and butterflies which will appeal to a wide audience; Ev Meynell, by contrast, has experimented with driftwood which suggests flowing figures and energetic figurative pieces. Jo Taylor is a ceramic artist who was inspired to create sculpture for the garden based on the architecture of nearby Brighton, taking as references decorative plasterwork and wrought iron. Mythical and wild beasts are the subject of Alan Williams’ work for which he uses reclaimed metal and other materials. All in all, do have a day out at Borde Hill. Besides the garden sculptures and the tree collection, there are azaleas and rhododendrons in May, the scented rose garden in June and July, whilst in August the herbaceous border takes centre stage. Then you can return in September or October for the autumn colours. And you can buy a sculpture as most of the work is for sale. My garden sculpture over the years has been placed in small town gardens, vast country estates, suburban patios and also in roof gardens. It is also satisfying to know that several pieces have been placed in the quiet gardens of hospitals, a setting which gives enjoyment to patients and staff alike. Garden sculpture has long been part of the tradition of classical estates in Britain as well as in Italy. Indeed many of us have enjoyed visiting the gardens of stately homes and seen beautiful displays of sculpture placed in a precise and formal way. These gardens emulated those of the Roman period with collections of statuary depicting mythological subjects such as gods and goddesses, ancient heroes and warriors as well as fantastic creatures. However, this way of siting garden sculpture has long been superseded by a more informal approach as garden design has developed over the years to produce the contemporary schemes which are popular today. Owning a garden sculpture nowadays is not just the prerogative of the aristocracy and the wealthy and we can all find an artwork which not only pleases us aesthetically but also suits our pocket. 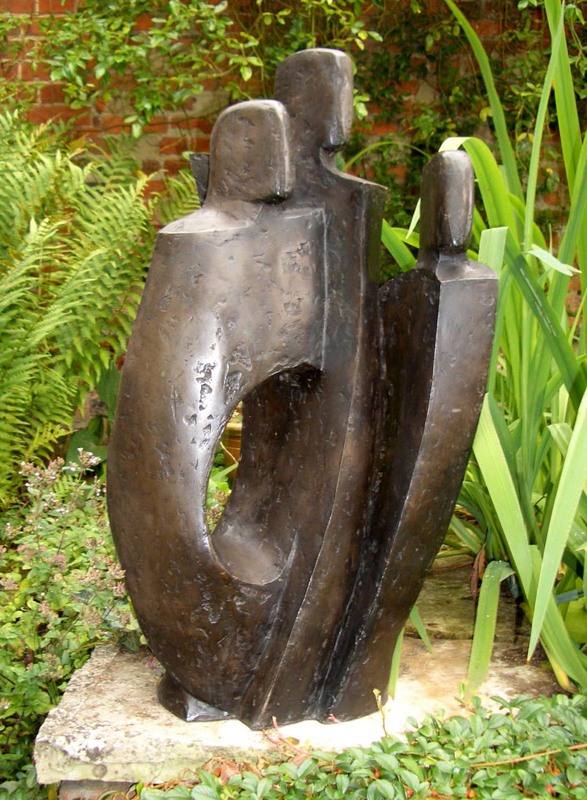 Although garden centres may be your first port of call, most of these outlets sell mass-produced pieces of little artistic merit and often of low quality, so if you are looking for something which is more exclusive it is best to choose the work of a sculptor whose work you admire. You can choose from a range of different materials which will withstand the rigours of the weather from foundry cast bronze and resin casts to metal, ceramic and stone. Many people particularly enjoy the qualities of wood, but this is bound to deteriorate outdoors over the years, so it is best to opt for a more lasting material. 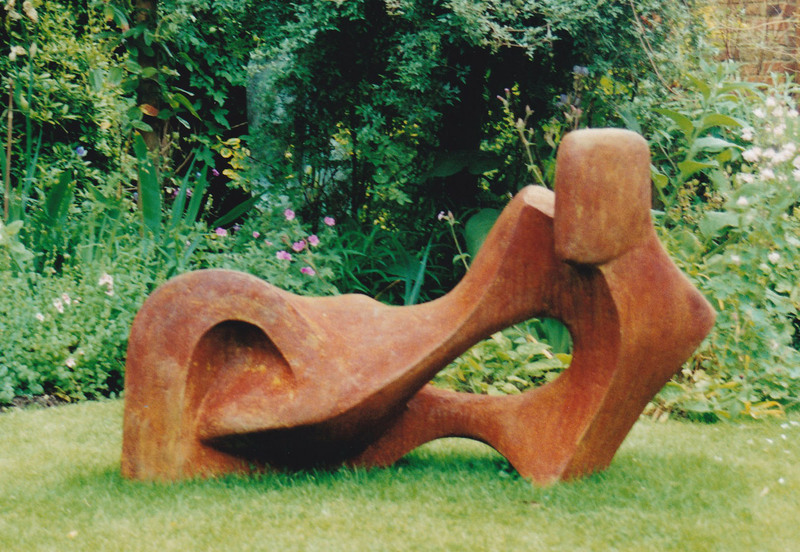 If you are thinking of buying a garden sculpture, take a walk round your garden, trying to imagine where best to site it. You may wish it to be the main focal point in the centre of a flower bed or at the end of a path; or it could add interest to an area where plants find it difficult to survive. Take a long view and even go into the house to view your chosen area, selecting a spot where the sculpture would be seen to advantage. Watch how the sunlight moves across the area from early morning to late in the day, which will give the sculpture entirely different effects. In selecting a site you will also need to look at the background of the proposed sculpture; it may be a brick wall, an area of dark foliage or a long view. You need to look for a contrast in the patination or colour of the work, so that it can be seen properly from a distance. Its reflection can also be taken into account when placing a garden sculpture by a lake or pond, and occasionally my clients have placed one of my pieces in front of a mirror, which creates an entirely different effect. My sculpture comes in a variety of different patinations, from the silvery-grey of aluminium to the verdigris or dark colourings of bronze, through to the vibrant rust hues of iron. 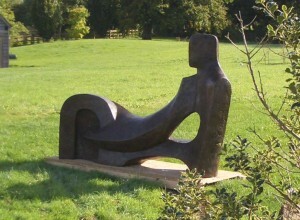 The scale of a sculpture is also important in relation to the site; a three foot piece on a patio which will always be viewed at close range will be perfectly suitable, but maybe lost from view in a large flower bed. However you could make a feature of having a group of small pieces which you come upon as a surprise in a larger space. Consider both the height and the width of the selected piece, and don’t forget to look at its depth as well, particularly if it is to be viewed from all directions. Most well-designed sculpture has been created to be viewed three-dimensionally, so that there is continual visual interest, as you walk around it. As a sculptor I am always happy to advise as to the selection and placement of one of my garden sculptures so that you make the most of the site, and be happy with your purchase for years to come. Limited Edition garden and interior sculpture for sale in bronze and bronze resin is a mainstay of my sculpture output, particularly in my case for garden sculpture. I always limit the editions to twelve works, which gives them a rarity not achieved by large editions of up to 100 or more. If working on spec, I usually have the first one of the limited edition cast in bronze resin as opposed to foundry bronze. One of the main reasons is the cost – foundry cast bronze tends to be about three times that of bronze resin. As I have about 60 pieces in stock at any given time, the outlay for them all in foundry bronze would be many thousands of pounds. However, should clients prefer limited edition sculpture in bronze rather than in bronze resin, the same mould can be used and the sculpture cast specially for them with the patination they require. As we have seen from the news in recent years, there have been a number of thefts of bronze sculpture by well-known artists, including a large work by Henry Moore and the Barbara Hepworth ‘Two Forms (Divided Circle) which was stolen from Dulwich Park in 2011. If a sculpture is to be sited in a public place, there is the prorblem of it being stolen just for the metal content, with no regard for its artistic worth. 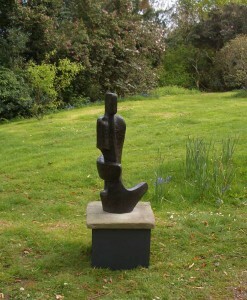 It is horrifying that over the past few years major works by Elizabeth Frink and Lynn Chadwick have had a similar fate. Indeed I have occasionally advised clients to opt for bronze resin for sculptures which are to be sited in an exposed area and therefore perhaps vulnerable. Bronze is of course the traditional material for sculpture from antiquity to the present day; it is a beautiful material and can be patinated in a variety of colours from greens to dark browns as well as being polished to a highly reflective surface. We have all seen the result of this on famous religious sculptures, parts of which have been burnished over the years by the continual handling and stroking by the faithful as well as by tourists. Besides these qualities it is almost indestructible which is a great asset, and it is extremely heavy. This last factor means that large sculptures will need specialist lifting equipment to site them; even an interior sculpture can weigh many pounds. By contrast, a limited edition bronze resin sculpture is a very suitable alternative. In looks it is barely distinguishable from foundry-cast bronze, unless the latter is highly polished. Indeed resin can be cast with a bronze, aluminium, iron or even a marble effect, as granules of the required metal or stone are placed first in the mould and therefore appear on the surface of the sculpture. It is a very durable medium – I have a ‘Welcoming Christ’ sculpture displayed on the exterior entrance wall or St. Michael’s Catholic Grammar School in Finchley, North London, which has been there since 1980. One of the advantages of bronze resin is that should any damage or vandalism occur, it can be easily rectified.